Courtesy of Seti Afoa, Samoa Events. Seti Afoa, one of the most forceful and impactful personalities in the global open water swimming community, is sincerely and deeply motivated about his passion for open water swimming - and he is more than happy to share it with others. He hosted the 2018 New Zealand Ultra-Marathon Swim Awards that honors marathon swimming achievements by New Zealand swimmers anywhere around the world and recalled the impetus for the black tie event, "In 2011 I had the honour of being invited by a friend of mine to be on his team for his Lake Taupo swim. Greg Sharp’s 13hr swim from Little Waihi in the south to the Taupo Township in the north is one of the greatest things I have seen. I am now in direct contact with many amazing ultra-ocean swimmers like Greg. There is a case for a national celebration of our sport where the sacrifices and achievements by ultra-marathon swimmers is acknowledged and honored. The current season that ends on the 30th May has seen on my count (there are more) 31 ultra marathon swimmers across 3 swims - two across the Cook Strait, sevent across Lake Taupo, 16 in the Chopper Swim Challenge, and six across the Apolima Strait. There are other swims and swimmers yet to go on the list. The Awards night is not just for ultra-swimmers, but for the open water swim community to come together and celebrate our sport." The inaugural event in Auckland, New Zealand on July 14th was sold-out where Afoa's passion was shared by many others. Among the night of celebration, Philip Rush, Sandra Blewett and Keith Hancox were honored with Lifetime Achievement Awards. Rush found himself in an unusual position. Not only was he honored for his many open water accomplishments, but he also served as the evening's keynote speaker when he described nostalgically about his record-setting achievements from the English Channel as a seasoned professional marathon swimmer to the Cook Strait crossing as a 16-year-old rookie. Blewett's achievements were also numerous - from the Cook Strait and across the Foveaux Strait to multiple crossings of Lake Taupo and her 44-hour marathon swim from Whangarei to Auckland. These swims were described to the audience and included the concurrent achievement of raising over $3,000,000+ for charity with her swims. Hancox was remembered for becoming the second person to swim Cook Strait in 1964 at the age of 25. 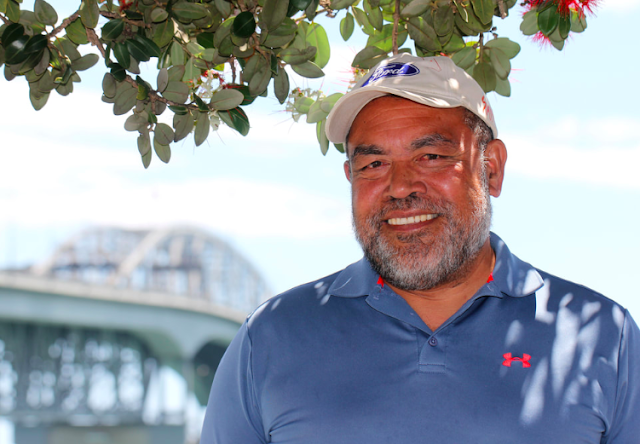 Afoa explained his purpose, “I wanted the Awards to honor current and past swimmers. This is one sport where someone achieves an amazing goal and swims for hours and even days, gets to the other side gets out and goes home. There is no applause, crowd or medal ceremony. The highlight for me was being in the same room with the community and listening to inspirational Legends Talks from current and past swimmers. It was incredible listening to Philip talk through the psychology of his amazing three-way English Channel crossing and how at the end of the third leg he was asked whether he wanted to do a fourth leg. He didn’t and he regrets it to this day. Caitlin O'Reilly of Auckland was the youngest female and youngest New Zealander to swim Cook Strait at the age of 12 in 2017. Chloe Harris of Christchurch was honoured for the New Zealand Triple Crown of Swimming that includes crossings of the Foveaux Strait from Stewart Island to the Bluff, the Cook Strait between North Island and South Island, and the 40.2 km Lake Taupo course. 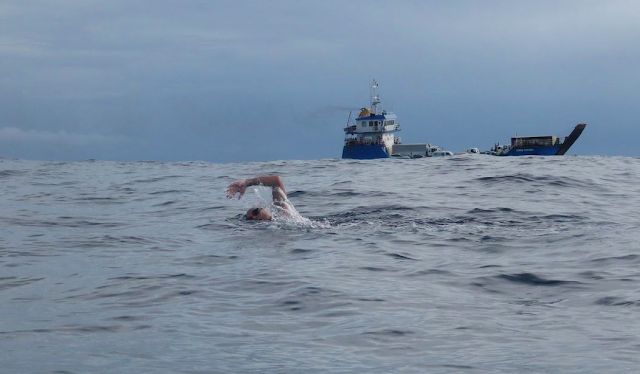 Afoa explained the link between a veterans like Hancox and Rush and emerging newcomers like O'Reilly, "The foundation for ultra-marathon swimming in New Zealand was well set by the pioneers and legends of the sport in the 1960's and 1970's. There were only two swimmers to swim the Cook Strait in 1960's: Barry Devonport and Keith Hancox. There were eight successful crossings in the 1970s; John Coutts completed two crossings as did Meda McKenzie at 15 years of age. Also, Lake Taupo was becoming a popular challenge. The third New Zealand swim across Foveaux Strait from Stewart Island to the bottom of the South Island is the unsung hero in this mix - it completes the New Zealand Triple Crown of ultra-swims.."
The swims include the 23 km Cook Strait (2), 34 km Lake Taupo (7), 22.3 km Apolima Strait (6), 20 km Chopper Swim Challenge (18), 41 km Around Rarotonga, Around Rangitoto, and the 22.6 km Matapouri Marathon from Poor Knights to Matapouri in Northland. There are also European and USA swims and new solo swims in Rarotonga and around New Zealand.